The following products are available for order on our home page. Flat printed text with a raised/embossed appearance. U.S. State Aluminum License Plates personalized with up to 10 characters. Individual or any quantity order. Printed with UV fade resistant inks and a weatherproof clear-coat finish. All current and many older U.S. State designs are available. This product can be ordered from our home page or by email. 3D text raised on a separate clear overlay using a layered construction of aluminum and acrylic materials; includes a clear cover and a chrome frame holding the layers together. 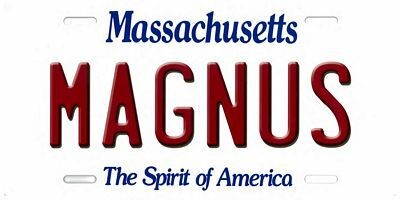 Individual U.S. State Aluminum License Plates personalized with up to 10 characters. Individual or any quantity order. Printed with UV fade resistant inks and a weatherproof clear-coat finish. All current and many older U.S. State designs are available. This product can be ordered from our home page or by email. We also offer the following products via commission. Custom order a flat printed aluminum plate with your own custom logo or design. Available in any quantity. Printed with UV fade resistant inks and a weatherproof clear-coat finish. Have your own custom logo embossed directly into an aluminum license plate. A minimum order of 50 plates is required per single design. We also offer U.S. state designs in embossed aluminum plates as well. Have your custom logo laser-cut into an acrylic mirrored plate. Available in any quantity. 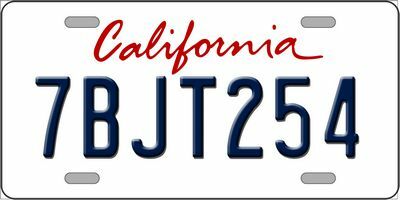 To commission one of these plates, please contact us for a price quote.